We all love to feel some strong bass in our music (the low frequencies, of course, not the fish). It provides a vital, solid foundation for music of every kind, and for many genres it’s the driving force that makes us feel the music in our innermost parts. It’s where music speaks to us at the most guttural, the most tactile level. It’s not a region of the audio spectrum that classical music frequently turns to for solo material, however. If you play the double bass, tuba, or bassoon, your options are somewhat limited when you want to step up front and center. 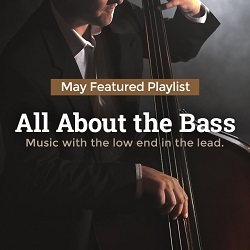 But don’t worry; we’ve put together a playlist that gets down with some of our favorite composers and pieces that are All About The Bass. To hear the playlist, access NML as usual, go to the Playlists section, and select the Playlist of the Month folder under the Themed Playlists tab. If you are on your institution's premises, you may also be able to access it if you CLICK HERE. 1. Edgar Meyer – Double Bass Concerto in D Major: III. Quarter Note = 190 – Edgar Meyer is about as revered a name as there is in the double bass world. Having made a career playing alongside artists like Chris Thile and Yo-Yo Ma, he has also done his part to contribute to the double bass repertoire by commissioning or composing a number of works himself. 2. Tan Dun – Double Bass Concerto, “The Wolf”: III. Allegro vivace - Premiered in January 2015, Tan Dun’s Double Bass Concerto, “The Wolf”, received its first recording the same year. It depicts the wolves that roam the countryside of China and Tibet, and their important contributions to their ecosystem. 3. Christopher Theofanidis – Bassoon Concerto: III. Threatening, Fast – Theofanidis picked up a Grammy nomination in 2017 for his Bassoon Concerto. It’s about as remarkable a showpiece for the bassoon as there is, with circular breathing required to sustain the long lines of the second movement, and with sustained runs of blisteringly fast notes in the third movement. 4. Fredrik Högberg – Rocky Island Boat Bay: Part 3: Chanson populaire – Swedish composer Fredrik Högberg has composed here a truly virtuosic piece for the tuba, one so challenging that he believes it to be currently unplayable by anyone but the commissioning soloist, Øystein Baadsvik. Have a listen to see just how much music can be squeezed out of a tuba. 5. Øystein Baadsvik – Tuba Concerto: III. Not too fast (quarter note = 138) – We’ve got back-to-back Baadsvik here, this time with a track the tuba player composed himself. We may not be tuba experts, but for our money, Baadsvik has got to be one of the most inventive players out there. So when he gets a chance to compose for himself, you know it will be something to hear. 6. Libby Larsen – Full Moon in the City: II. Juking the Moon - Libby Larsen grew up in Minnesota, and she went on to become the first female composer appointed to a residency with a major orchestra (the Minnesota Orchestra) in 1983. Yes, it really took that long to reach that milestone. Her style is distinctly American, and her favorite composers are as diverse as J.S. Bach, Harry Partch, and James Brown. 7. Oscar Peterson – March Past – Oscar Peterson’s sixty-year musical career earned him status as one of the greatest jazz pianists of all time. That’s pretty awesome, but what is he doing on this playlist? Well, when one of his tunes gets arranged (by Johannes Rupe) for bassoon quartet, you can’t help but investigate what that’s all about. 8. Alec Wilder – Tuba Suite No. 1, “Effie the Elephant”: IV. Effie Joins a Carnival – If you want to portray an elephant in music, you’re probably gonna look to the lowest instruments. In Carnival of the Animals, Saint-Saëns went with the double bass, and here 20th-century American composer Alec Wilder opted for the tuba. 9. Nino Rota – Divertimento concertante: II. Marcia: Alla Marcia, allegramente – Nino Rota is primarily known for his more than 150 film scores, which included work for Federico Fellini, Luchino Visconti, and Francis Ford Coppola. In the middle of his busy schedule, he found time to compose other music, however, including this piece for double bass and orchestra. 10. Kalevi Aho – Contrabassoon Concerto: II. Presto – Kalevi Aho is most immediately notable for two things: his uncanny knack for capturing his harshly cold yet uniquely beautiful Finland in orchestral form, and his mission to compose a concerto for every instrument in the orchestra. Here we’ve selected a movement from his contribution to the contrabassoon repertoire. 11. Domenico Dragonetti – 3 Waltzes: Waltz No. 12: Presto – Dragonetti established a reputation as one of the great bass players of the early 19th century, advancing both technique and composition for the instrument to a considerable degree. Born in Venice, he moved to London when he was thirty-one, where he spent most of the rest of his life. 12. Giovanni Bottesini – Double Bass Concertino in C Minor: III. Finale: Allegro – Bottesini was born a couple generations after Dragonetti, and he continued on the advocacy for the double bass, raising the performance level to such a degree that he is sometimes referred to as the Paganini of the bass. 13. Johann Baptist Vaňhal – Double Bass Concerto: III. Finale: Allegro – Vaňhal was a Bohemian composer who spent the majority of his career in Vienna. He was a contemporary of Haydn and Mozart, and highly esteemed in his day. He was extremely prolific as well, composing more than 70 symphonies by the time he reached his mid-forties. 14. Henry Eccles – Double Bass Sonata: I. Largo – Henry Eccles was an English composer from the Baroque era who seems to primarily be known for his violin sonatas. However, this piece for double bass indicates an interest in an instrument that didn’t get much time in the spotlight in his day. His father Solomon and brother John were also composers. 15. Reinhold Glière – Intermezzo and Tarantelle: Intermezzo – You might not guess it from his name, but Glière was a Russian composer of German and Polish ancestry. The latter half of his life was spent under Communist rule, and he was named “Artist of the People” four times—in Azerbaijan, Russia, Uzbekistan, and finally the USSR as a whole in 1938. 16. Ralph Vaughan Williams – Tuba Concerto: III. Finale: Rondo alla tedesca – There may not be a large number of tuba concertos out there, but the one RVW composed at the age of 82 is as close to a classic as there is. It was a work that he intentionally kept very simple and direct so that audiences might enjoy it without needing prior explanation or knowledge. 17. Barbara York – Tuba Concerto: III. Allegro furioso – Barbara York is an accompanist, choir and theater director, and composer who has been active in both Canada and the U.S. for decades. She has been a regular contributor to the tuba repertoire. 18. Philip Wilby – Euphonium Concerto: Part I. Dance Zeibekikos – Philip Wilby is a British composer and professor who has primarily been working in the brass band world. The selected portion of his Euphonium Concerto was inspired by raucous party dances from the Greek islands. 19. Eve De Castro-Robinson – These Boots (Are Made for Dancing) – De Castro-Robinson is a composer, teacher, and music critic from New Zealand. This particular piece of music was composed for a trio of less wieldy instruments—the double bass, the bass clarinet, and the bass trombone. 20. Peter Maxwell Davies – Strathclyde Concerto No. 8: III. Recitative–Allegro–Più allegro–Adagio – Nearly every year between 1986 and 1996, Davies composed a new concerto for the Strathclyde Region of southwestern Scotland. This recording of No. 8 features Davies conducting, with the bassoon soloist being Ursula Leveaux, for whom it was originally composed. 21. BONUS – John Deacon (Queen) – Another One Bites the Dust – When you come across a performance of the Queen hit “Another One Bites the Dust” by a tuba ensemble, well…this is what you get. Each month, Naxos Music Library presents a themed playlist for our subscribers to enjoy. We know that a database of over 1.9 million tracks can be a bit daunting, so we'd like to highlight some of the amazing music that is available to you. Let it kickstart discovery!